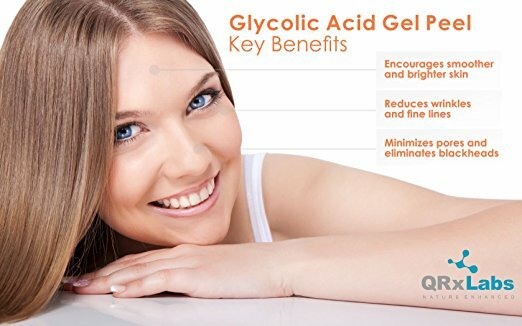 This professional grade Glycolic Acid 50% Gel Face Peel stimulates collagen production, and reduces the appearance of fine lines, wrinkles and hyper-pigmentation. It also increases cellular turnover, exfoliating your skin and removing all of the dead cells that have blocked your pores, created blackheads and acne, and created a barrier preventing your moisturizers and serums from penetrating your skin. Professional grade Glycolic Acid 50%. Exfoliates dead skin cells and removes blackheads. Leaves skin fresh, clean and healthy. Made in the USA in an FDA-registered facility. Who will benefit from using the QRxLabs Glycolic Acid Gel Peel? QRxLabs considers this to be a ‘medium peel’, so it is best if you have used a lower percentage peel first, so that you don’t damage your skin. The FDA recommends that face peels over 10% AHA are applied by a trained professional, because great care must be taken to not leave the gel face peel on your skin too long. Having given you this warning, you can benefit from a 50% glycolic acid gel face peel if you have not found the results you wanted from lower percentage peels. Problems such as acne, persistent pigmentation patches, persistent deep blackheads and fine lines, may all be improved by using one of these stronger exfoliants. Glycolic acid also encourages the production of collagen, so if one of your problems is a loss in definition along your jaw line or your cheeks, then you might well benefit from using this product. 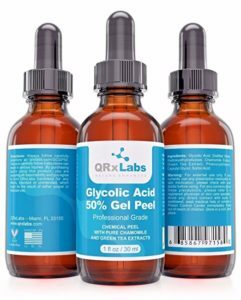 The QRxLabs Glycolic Acid 50% Gel Face Peel comes in a 1oz (30ml) dropper bottle and is made in the USA at an FDA registered facility. It contains Chamomile and Green Tea extract, as well as glycolic acid, and is free from parabens and artificial fragrances, and is also cruelty free. Ingredients: Glycolic Acid, Distilled Water, Hydroxyethylcellulose, Chamomile Extract, Green Tea Extract, Phenoxyethanol, Caprylyl Glycol, Sorbic Acid. Glycolic acid is a member of the alpha hydroxy acid family (AHA), which are natural exfoliants. Glycolic acid has the smallest molecular size of the AHAs, so that it can more easily penetrate the layers of your skin, removing dead skin cells and other debris that collected in your pores and the surface of your skin. All of this debris blocks your pores, creating blackheads and some forms of acne, whilst on the surface of your skin it creates a barrier preventing your moisturizers and serums from penetrating your skin. This means that your skin look dirty, grey, tired and blemished and when you spend lots of money on good quality moisturizers and serums, they just sit on top of your skin, doing nothing. This is one of the biggest causes of complaints about skincare products not working properly, because they can’t get through your skin to actually do their work! Glycolic acid exfoliates all of this debris from your skin, leaving it clear, fresh and healthy. FYI: Remember that the greater the percentage of glycolic acid, the stronger the exfoliation, so always read the instructions and if unsure, talk to your medical professional before using these stronger gel face peels. Chamomile has anti-inflammatory, anti-fungal, antibacterial and antiseptic properties, and contains essential oils and antioxidants. 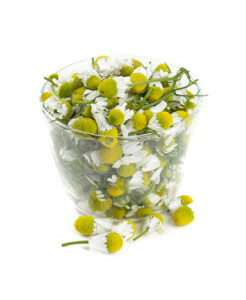 This means that chamomile is perfect for people with sensitive, inflammed or acne prone skin. As an antioxidant it also helps to fight the damage caused by free radicals and too much exposure to UV light. So it is a good ingredient for anyone with patchy pigmentation problems, age spots or sun spots. Chamomile is soothing and helps to heal your skin. Green Tea is one of the super antioxidants that protects your skin from free radical damage and helps to reverse the effects of too much UV exposure. It also has a positive effect on your skin’s micro-circulation, has anti-inflammatory properties and prevents collagen from braking down. Green Tea helps to keep your skin healthy, your skin elastic and younger looking and helps to give you an even skin tone. The majority of online customer reviews are very positive. Customers think that this glycolic acid gel face peel is quite amazing. It works well, leaving them with smoother skin and less blemishes. It works amazingly well. I am very happy with the results. Massive improvement in one application. This stuff works! Be careful not to leave it on too long because it WILL burn and leave redness. My skin is soft, sun spots are fading and wrinkles are much less noticeable. This Glycolic Acid 50% with Chamomile and Green Tea helps to reduce acne and blemishes, improves the appearance of fine lines, deeply cleans your pores, removes blackheads, evens out your skin tone, reduces pigmentation problems and increases the production of collagen. It contains Chamomile and Green Tea and is very well priced. Customers really like how well it works to clean their skin, reduce blemishes and even out their skin tone – it is well worth a look.